No need to leave the park, we’ve bought the fun to you! 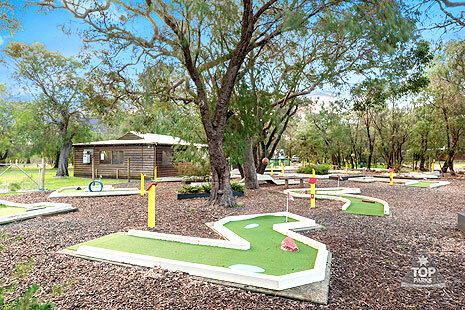 Have a fun game of mini golf under our shady trees. Mini golf is free to anyone staying in the caravan park. 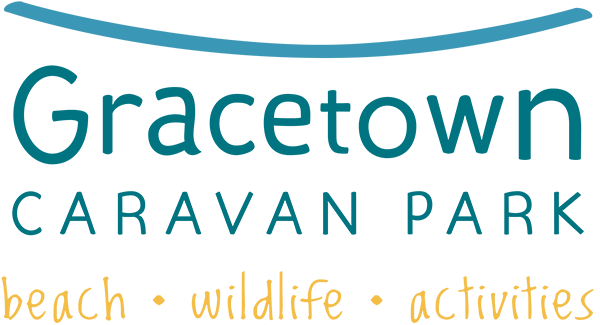 Equipment can be collected at the office. 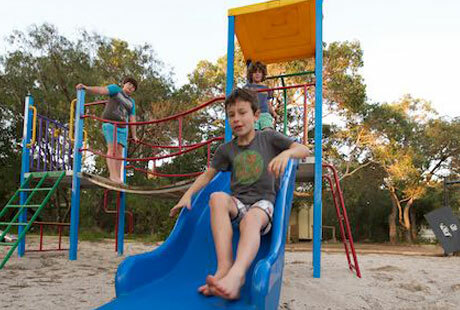 Our childrens’ playground is located centrally within the park and is under shady trees. Watch as the kids burn some energy and make some new friends at the playground during your stay. 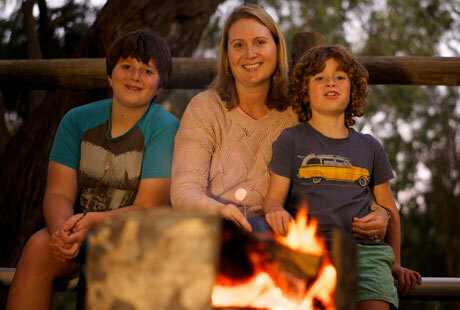 A Communal Fire pit is located at the camp kitchen and is for everyone to enjoy. A great way to spend the evening resting and meeting other people staying in the caravan park (seasonal). Bring a pillow, blanket, chair and sit back to watch the night time movie on the big screen. 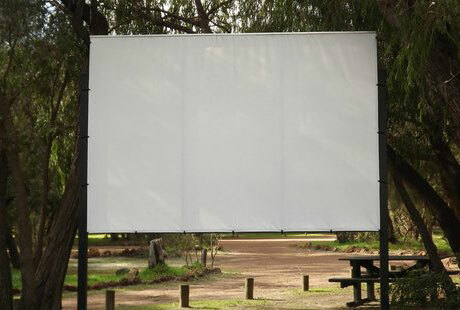 Movies are played during the school holidays (seasonal not Winter). Relax with the kids and enjoy the open air movies under the stars. We have a full sized beach volleyball court set up and available for use. 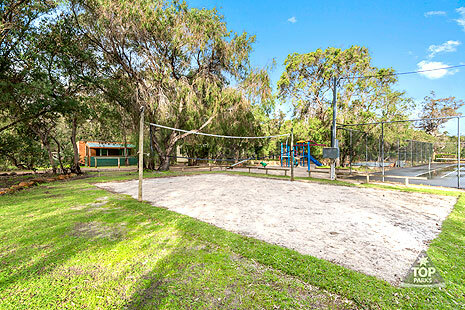 The area is kept clean and is perfect for a fun game of afternoon beach volleyball. Grab a ball from the office and have a go! Love shooting hoops? 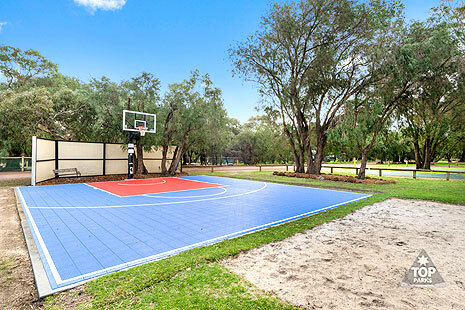 We’ve got a new basketball court for you to show everyone your skills! Why not challenge friends, family or other park guests to a friendly match? A waterslide is the perfect way to enjoy the summer school holidays with the kids. 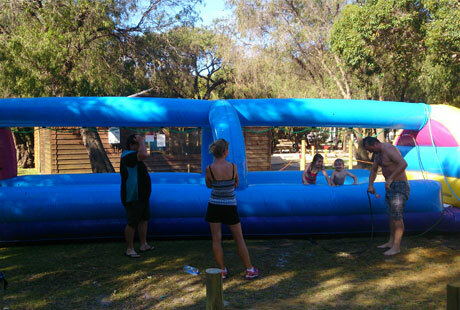 Cool off and have a giggle as everyone goes slip and sliding on the giant waterslide. 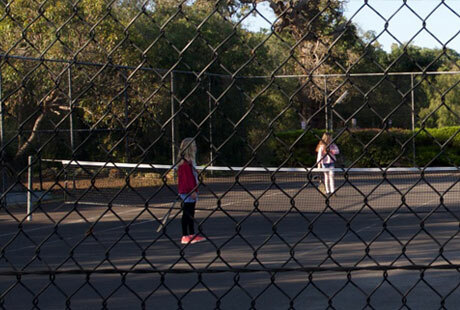 Our tennis courts are available for everyone to enjoy and tennis equipment can be collected from the shop. Have a game and show off your skills on the tennis courts. During the school holidays we set up a bouncy castle for the kids to use all their energy on. Stay with us and the kids will have bouncing good fun! Who said caravan parks are boring! Not our park now that we have a brand new mini golf course! That’s right … stay with us and enjoy free mini golf for the length of your holiday. New for 2018 we also have a brand new Basketball half court! And that’s not all. The kids will be occupied for hours at the kids’ playground, or slip’n’slide on the inflatable waterslide (summer holidays) , or bounce themselves silly on the inflatable bouncy castle. There’s also tennis and volleyball courts for the adults if you’re feeling sporty. All this is included for FREE with your stay , so book your next holiday to the beautiful South West today!